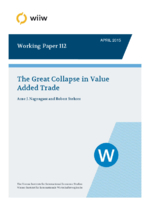 This paper studies the great collapse in value added trade using a structural decomposition analysis. We show that changes in vertical specialisation accounted for almost half of the great trade collapse, while the previous literature on gross trade has mainly focused on ﬁnal expenditure, inventory adjustment and adverse credit supply conditions. The decline in international production sharing during the crisis may partially account for the observed decrease in global trade elasticities in recent years. Second, we ﬁnd that the drop in the overall level of demand accounted for roughly a quarter of the decline in value added exports while just under one third was due to compositional changes in ﬁnal demand. Finally, we demonstrate that the dichotomy between services and manufacturing sectors observed in gross exports during the great trade collapse is not apparent in value added trade data.